Rep. Alexandria Ocasio-Cortez, the freshman Democrat serving New York’s 14th District, has indisputably become a presence on Capitol Hill. During a visit to Washington before being sworn in, the 29-year-old, who just a year ago was bartending, joined demonstrators for a climate-change protest in House Speaker Nancy Pelosi’s (D-Calif.) office. And in her first week as congresswoman, Ocasio-Cortez, whose Twitter following compares more closely to those of presidential aspirants than her fellow new members, appeared on CBS’ “60 Minutes” for the kind of profile typically reserved for veteran politicians. She’s also making a name for herself beyond the Beltway. The latest Morning Consult/Politico survey found Ocasio-Cortez to be better known than a number of the Democratic Party’s possible 2020 presidential contenders, including former Texas Rep. Beto O’Rourke, who in 2018 enjoyed his own time in the spotlight as the unsuccessful challenger to Sen. Ted Cruz (R-Texas). The Jan. 11-14 poll surveyed 1,984 registered voters and has a margin of error of 2 percentage points. Polling also shows that the rising profile of the Bronx-area lawmaker registers most among the opposition, with Republican voters forming opinions about her faster than Democrats. “Ocasio-Cortez has clearly become a figure of derision in the conservative press – and a figure of great interest and even admiration in the liberal imagination – and the attention she has garnered has led to her quite quickly becoming a major national figure,” said Kyle Kondik, managing editor of Sabato’s Crystal Ball at the University of Virginia Center for Politics. Since August, Ocasio-Cortez has seen a 14-point increase in the share of voters who have an opinion on her. 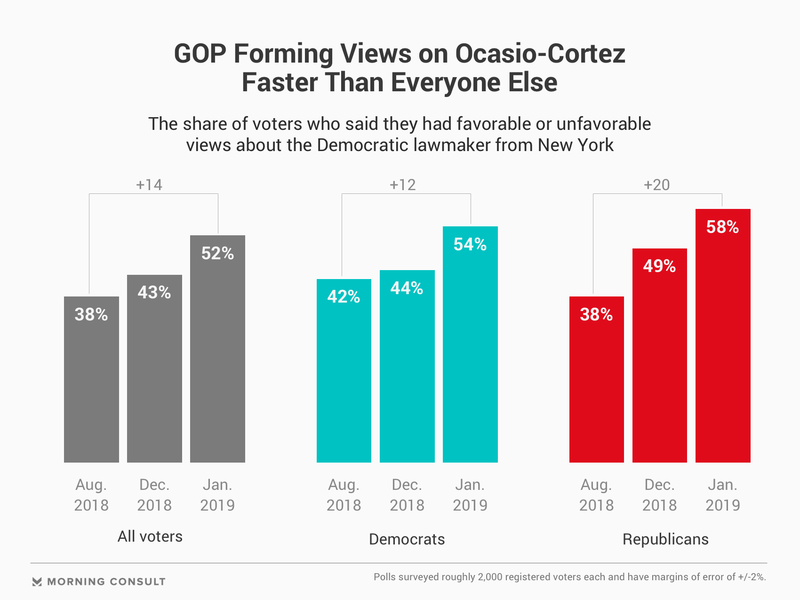 The greatest increase in opinions – 20 points – came among Republicans, not Ocasio-Cortez’s own Democratic base. Since the August poll, which was conducted after her June primary victory over then-House Democratic Caucus Chairman Joe Crowley, net favorability for Ocasio-Cortez dropped 18 points among Republicans – including 11 points since a poll conducted in December. Only 9 percent of Republican voters have a favorable view of her, while 49 percent have an unfavorable view. Kondik said the shifts among Republicans are a sign of the power of the conservative press – and Fox News in particular. Data analyzed by The Washington Post found that Fox News and Fox Business mentioned Ocasio-Cortez more than CNN and MSNBC before the election, and it’s only increased since. Republicans on Capitol Hill haven’t made it a secret they’re trying to elevate Ocasio-Cortez, whose office did not comment for the article. In a December interview with Morning Consult, National Republican Congressional Committee Chairman Tom Emmer (R-Minn.) said people like Ocasio-Cortez help Republicans make a “very sharp contrast” between the two parties, something he said could help the GOP in America’s suburbs, where they lost ground in 2018 amid a 40-seat nationwide loss. 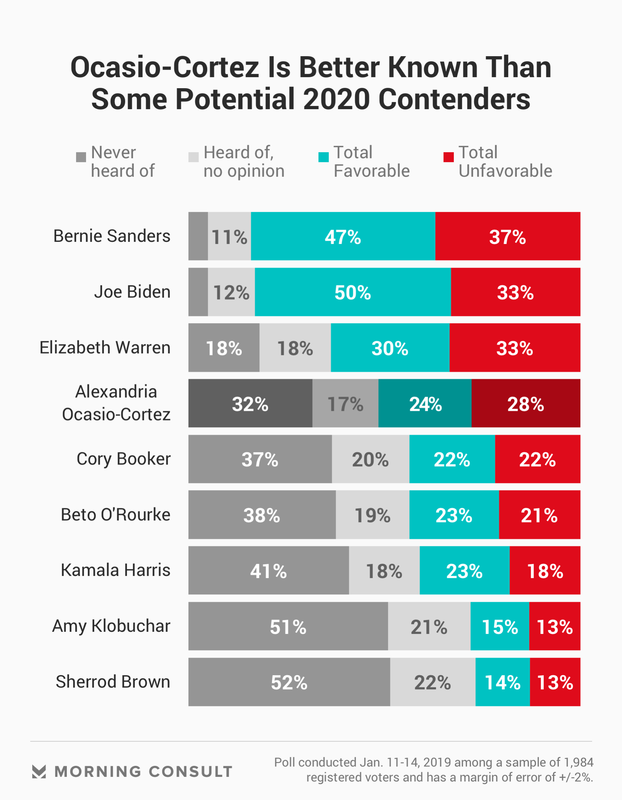 Among all voters, her net favorability is 4 points underwater – close to some, but still lower than all of the potential presidential contenders surveyed. Overall, 24 percent of voters said they view her favorably, compared with 28 percent who did not. It’s a similar margin to her figures in Morning Consult’s first survey on her popularity in August, when 18 percent had favorable views and 20 percent had unfavorable views. Among Democrats, her net favorability is 32 points, higher than O’Rourke’s. That popularity and name recognition is likely to give her an outsize influence when it comes to the looming internal debates about where Democrats are headed as a voting bloc.